The government's NHS policy seems to be based on Theodore Roosevelt's dictum, "If you can't convince them, then confuse them". The world is changing. We face new challenges. The English NHS needs to change and we must learn to transform our resources and find a positive view to a new way forward. As an NHS Champion and Thought Leader I know how vital it is that NHS stakeholders - patients, colleagues and partners - participate in a robust sustainable partnership, engaging in the transformation of the NHS, its design, structure, function and governance. We must understand compassion and accountability, so that NHS England can truly realign the mindset of campaigners to be resilient, sustainable and effective. Let’s start again shall we? If you read the first paragraph and wondered what the hell I was wobbling on about - that’s a good sign. If you read it thinking it made any sort of reasonable sense - then we need to worry. One of the key weapons being used against the NHS, public and campaigners is the growing misuse of socially minded vocabulary and community development buzzwords. You’ll all have come across them. Engaged, participatory, resilient, empowering, co-produced, personalised, sustainable…. You’ll find these buzzwords all over the NHS, mixed with a dash of new age personal therapy speak borrowed from the West Coast of America (as we’ll see shortly, there are other imports from the West Coast, too). Our NHS staff are bombarded with this doublespeak in top down memos, guidelines and motivational training sessions. The public are bombarded by messages and ‘consultations’ pushing the ‘transformational’ changes taking place and inviting them to be part of a ‘participatory revolution’, as Tim Kelsey’s NHS Citizen puts it. Well-meaning people are led to believe that their contribution might have some influence. Indeed it may well be worth going to some of their events, at least to try to understand – and query – how they are using these buzzwords. Meanwhile Health Secretary Jeremy Hunt promises us a rosy and optimistic picture of a ‘technology revolution’ and a ‘7 day revolution’, all ‘human centred’, of course. This dishonest vocabulary aims to fool the public into supporting a host of dubious changes. It relies on a counterpoint image of a desperately archaic NHS, crumbling in an inevitable apocalypse of overweight aging diabetic bed blockers who really should know better and die in their own beds – “Care Closer to Home”. It glosses over the fact that public funding is being withheld (and wasted on market bureaucracy). The manipulative buzzword bingo tries to persuade us that when we take part in their endless focus groups, petitions and surveys, we are helping the ‘struggling’, ‘failing’ NHS to meet the ‘challenges of the 21st century’. It hides the fact that private corporations are moving in and setting the agendas. It hides the fact that behind the trusted blue square of the NHS logo, private health and insurance firms are already operating, mostly unseen by the public. 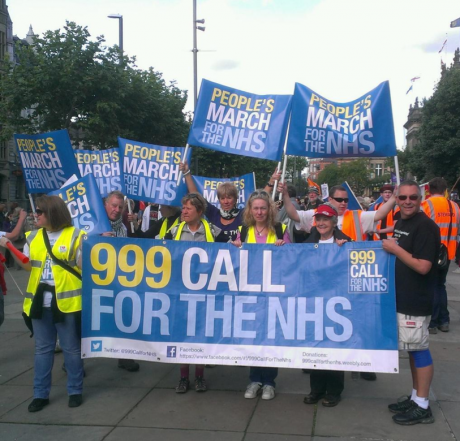 At 999 Call for the NHS this is the change we want. We want to see private company logos displayed clearly at hospitals so public and staff are fully aware of who is providing the NHS service and who is responsible for cutting services, and destroying public confidence and staff morale. Why is it up to campaigners to have to dig for, and publicise the truth, when it should be displayed openly and transparently? Well, we want some real global leadership. Some real openness and transparency. A real breakthrough in the information we have about our local services. And we want the truth. That the NHS is being set up to fail, by people who want it privatised. When I joined 999 Call for the NHS in February last year, none of us had any idea of the dark murky world of NHS politics we were entering. It was a group of mums in Darlington marching 300 miles from Jarrow to London. We are learning as quickly as we can. But the actions and spin of NHS England and the corporate health, insurance, technology and pharma companies are bewildering and confusing to those of us trying to keep up. Just as we’d begun to get our heads around 2012’s Clinical Commissioning Groups (CCGs) and Commissioning Support Units (CSUs), new NHS boss Simon Stevens’s Five Year Plan ushered in a new layer of jargon and organisational spaghetti – Primary & Acute Care Systems (PACS) and Multidisciplinary or Multispecialty Health Teams (MHTs). So-called ‘success regimes’, ‘vanguards’ ‘prime’ and ‘lead providers’ are driving through a confusing muddle of more top-down reorganisations (that Cameron promised us we’d never have) and supposedly ‘locally devolved’ decisions (that all seem to rest on the loss of local general hospitals and A&Es). The common element in the chaos is the increasing opportunities for private provision and ‘partnership’. Remember that West Coast connection we mentioned? Turns out it’s not just the New Age rhetoric we’re importing. Seattle's Virginia Mason are now moving in to a number of NHS Trusts with consultation support and new models of “Lean Management” and “How to Motivate your Staff” (for less money of course). And Stevens' PACS are explicitly modelled on San Francisco's Kaiser Permanante’s Accountable Care Organisation model (a latter development of the American HMO model)- despite US concerns about restrictions on which patients can be treated where, long wait times, and still high costs. I asked a friend in California recently what Kaiser were like. She smiled, “Oh they're great! ‘Til you get sick”. Their focus on prevention and health resilience belies a reluctance to provide full health care that might cost shareholders their profit. Only a top-up payment plan will see you in the real hospital. Our NHS is being torn apart by bankers, politicians and their corporate outsourcing consultancy advisors. It is being fragmented, restructured, and redesigned towards American style insurance based, profit driven health industry.